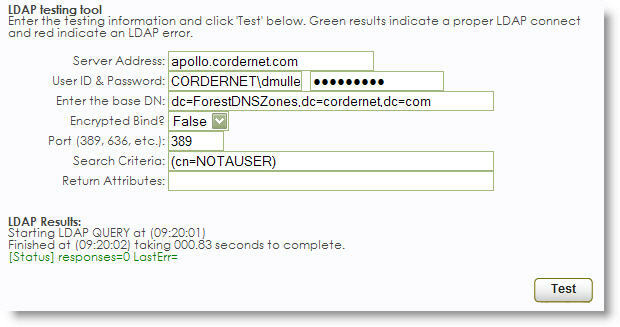 The Trac system provides an LDAP test page that can be accessed from your main menu. Simply click on the Trac Man icon, then on Utilities and Prefs. There you will find a tab labeled “LDAP Tool”. Fill out the form with values provided to you by your system administrator and click test. A green response is good, a red is bad. Once you send Redrock the necessary information, a team member will implement a binding script on your server and contact you once completed. For single-bind authentication, your setup is complete! Log in using an account with sysadmin privileges. Type “LDAPname” (without quotes) in the top field, and your lookup account username in the bottom field, then hit save. Type “LDAPpass” (without quotes) in the top field, and your lookup account password in the bottom field, then hit save. Type “newLDAP” (without quotes) in the top field, and “yes” (without quotes) in the bottom field, then hit save.